A large and dramatic 1794 J. B. B. 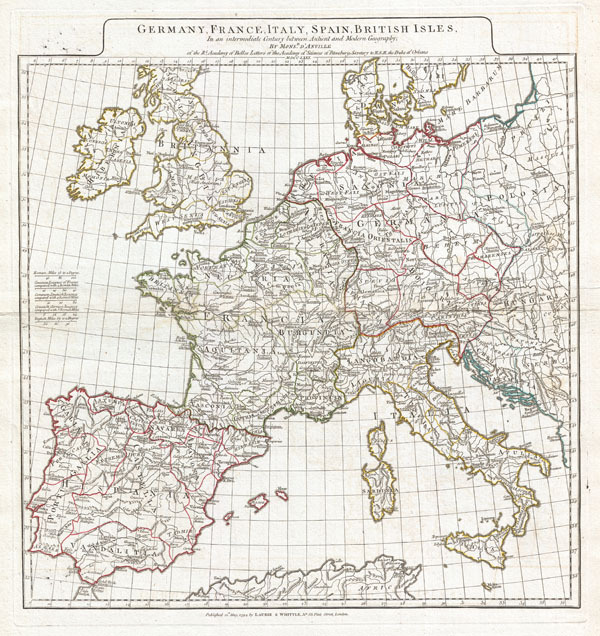 D'Anville map of Western Europe. Covers from the British Isles south to Spain and east as far as Hungary, Poland and Dalmatia. This map is intended to represent western Europe following the decline of the Roman Empire but before the onset of the Dark Ages. Details mountains, rivers, cities, roadways, and lakes with political divisions highlighted in outline color. Features both ancient and contemporary place names, ie. Parisii and Paris, for each destination - an invaluable resource or scholars of antiquity. Title area appears in a raised zone above the map proper. Includes five distance scales, center left, referencing various measurement systems common in antiquity. Text in Latin and English. Drawn by J. B. B. D'Anville in 1762 and published in 1794 by Laurie and Whittle, London. Phillps (Atlases) 571, 572, 599.